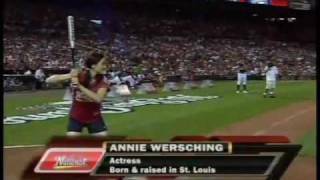 Bleacher Report, one of the largest sports media websites and newsletters on the internet, has listed Annie Wersching in their “Hottest Softball Players Ever” list. We certainly agree! Other celebrities making the list include Jessica Lowndes of 90210, Jenna Fischer from The Office, singer Ashanti, television personality Maria Menounos, and swimsuit model Marisa Miller. She’s in very good company!